No rinse foaming hand wash cleans hands without the use of water! Simply dispense into hands and rub together until dry. No Rinse Foaming Hand Wash.
Cleans hands without the use of water. Maximum Fragrance Note: Some fragrance and essential oils may thin, thicken and/or cloud this base. You will want to conduct performance testing to ensure your final product is safe and performs as you desire. Water, Aloe Barbadensis , Tocopheryl Acetate, PEG-7 Glyceryl Cocoate, Cocamidopropyl Betaine, Propylene Glycol, Benzalkonium Chloride, Phenoxyethanol, Tetrasodium EDTA. Water, Aloe Vera , Vitamin E Acetate, PEG-7 Glyceryl Cocoate, Cocamidopropyl Betaine, Propylene Glycol, Benzalkonium Chloride, Phenoxyethanol, Tetrasodium EDTA. This is a water based product. 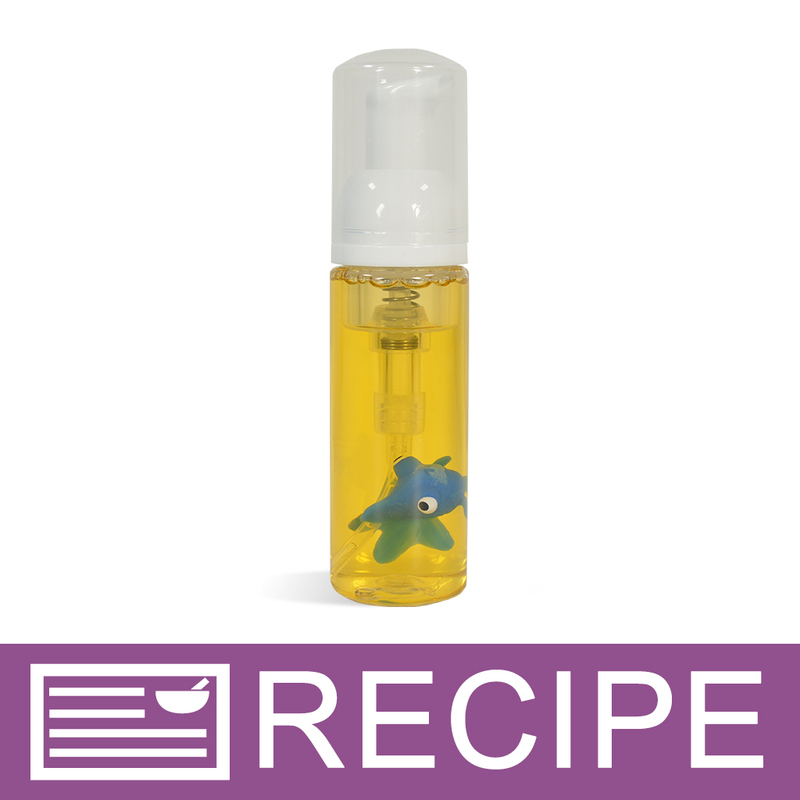 If you use straight fragrance oil, it will likely float or sink instead of incorporating into the base. 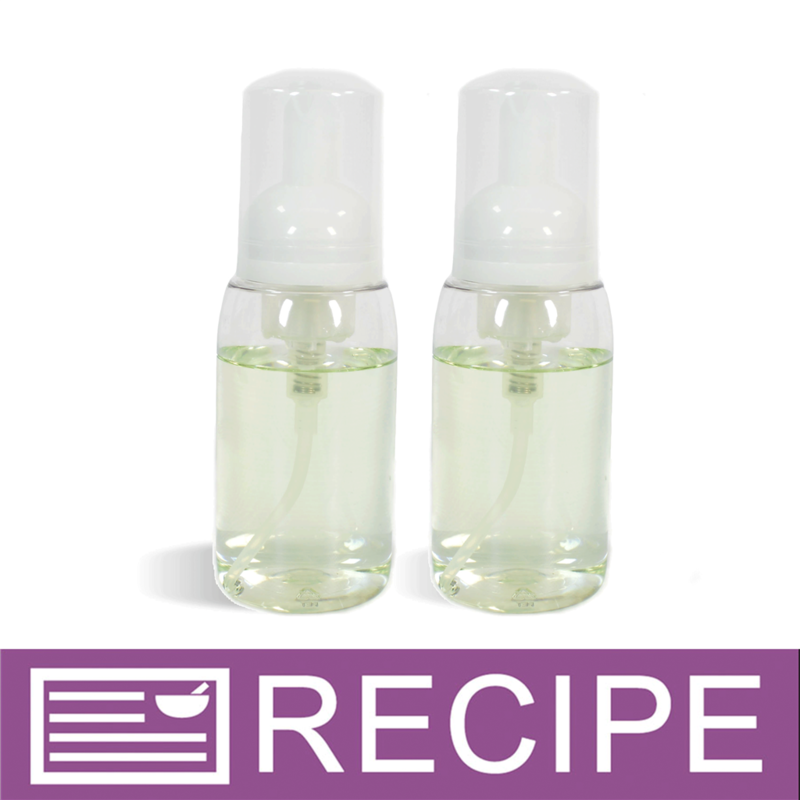 (To make your fragrance oil water soluable, mix your fragrance oil with our fragrance oil modifier as directed.) Add modified fragrance oil or water based fragrance to this base. (Add .1 ounces of fragrance for every 9 ounces of base). To avoid a cloudy base, you may need to heat in the microwave for 30 seconds before adding color. Color with Stained Glass Liquid as desired. Pour into foaming bottle below the foaming injector. 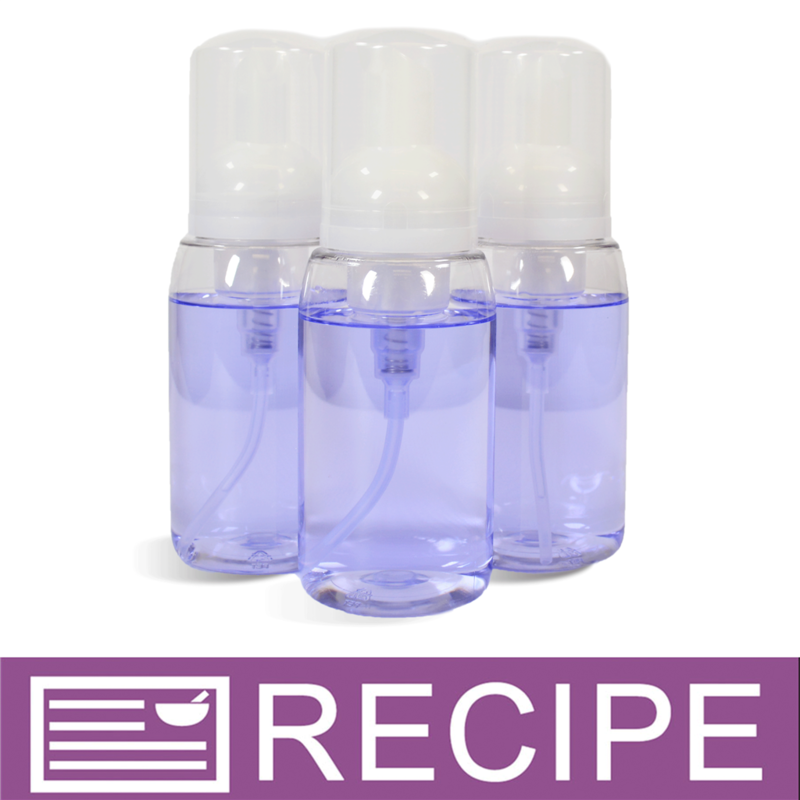 Overfilling the bottle may result in the air injector to fill with product and malfunction. To use, dispense foam into hands and rub together until dry. "Great and easy to use"
COMMENTS: This was very easy to make. They were great gifts. COMMENTS: When I fist got this it was perfect for my tree year old who hates washing his hands. I do find that it does leave hands a little bit dry but otherwise it works fantastic. COMMENTS: My husband asked me to make an alcohol-free foaming hand sanitizer and I honestly thought he was crazy. There was no way I would be able to do that but this base changed everything! He loves it and so do my customers! It holds scent well and leave your hands silky smooth! COMMENTS: Very easy to use,easy to add fragrance and color. "Nice, kinda sticky at first"
COMMENTS: This is kind of sticky feeling on first use, but after you rub in and allow to dry, it quickly soaks in and leaves no residue. I like this hand wash and will most likely order more. COMMENTS: Great new product! The no rinse foaming hand wash feels great while using. Does not sting open cuts like alcohol gel would. After it is has dried, hands feel clean, and skin is not sticky or filmy feeling. Ordering more! • No sting when applying. • No sticky feeling after use. • No odor before FO added. • Be able to add FO without modifier. "Can I say this product is Environmentally friendly? Or sustainable?" Staff Answer It is up to you how you want to advertise this product. There is no waste and it is rubbed into the skin. There is no water or paper towels needed to wash and wipe hands. "Can aloe vera be added to this as a thickener? I'm looking at using it in a 1oz flip top bottle and eliminate the foaming of it. " "Hi! Label requirements say ingredients need to be listed by weight, right So, can you tell me the percentage of the ingredients in this product so I can label accordingly. Or where I should add fragrance on the label of the hand wash? I used fo and polysorbate 20 each at 1%. (Product is cloudy, as expected, but preforms well.) Thanks!" Staff Answer If adding an ingredient at 1%, this would go at the end. Any ingredient at 2% or less would go at the end. "Can a moisturizer be added to this base to make it softer on the skin? If so, what is recommended, and in what amount?" Staff Answer We have not added a moisturizer but you can add one of choice. You might try glycerin or honeyquat. We recommend no more than 2% to be sure everything blends together. "Could this be used as a dry dog shampoo "
Staff Answer We do not know how this product will work on a dog. You would need to test this. "Can I add lavender essential oil to this instead of a fragrance?" Staff Answer Yes, you can use either fragrance or an essential oil. "Can Bubble Wash Thickener be used with the No Rinse Foaming Hand Wash? " Staff Answer No it cannot. The only ingredients that should be added to this base are modified fragrance and color. "Would this product be safe to use on your entire body? Used while camping for a "field shower", for example?" Staff Answer No symptoms are known or expected from skin contact. It should be okay to use on the body, but avoid sensitive areas and eyes. "Will this work with my 1 oz Clear Cylinder & Natural Flip Top (Surplus) bottles? Or does this hand wash need the pumps to work properly? Thanks." Staff Answer In order for this hand wash to foam, it must be used with a foamer bottle/top set. "If the no rinse foaming hand wash sat in a hot environment, like a car during the summer, would it adversely affect the product? " Staff Answer This product has a maximum heating temp of 120°F. If the product reaches a higher temperature, the preservative may be inactivated. "Does this product kill bacteria.? If so, what percentage.? Is it as effective as an alcohol based hand cleaner.? " Staff Answer We do not state that this product is a hand sanitizer. The ingredient, Benzalkonium Chloride, is considered an antibacterial agent, but is not alcohol based. This product may help with germs, but we have no specific information on this. "There is no ingredient list with this product. Is it Natural? And what are the ingredients please? Thanks"
Staff Answer This is a new product and we have not listed the ingredients yet. This is not a natural product, though. We will work on getting the ingredients listed before the product arrives.